Having a beautiful, dedicated workout room in your home is a great way to be sure you never have an excuse for skipping a day. 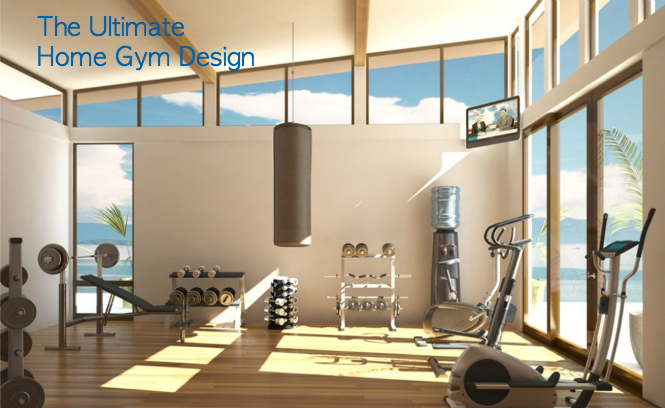 And home gym design services are the best way to ensure you get the look you want that complements your home’s design. No matter whether you have one main piece of gym equipment or a stable of workout machines, a well-designed space will look amazing and act as your motivation to move. Create a cozy workout space with rich woods that flow throughout your home. Striated bamboo flooring runs from the floor straight up one wall. Overhead fans will keep you cool and comfortable for intense workout sessions. It’s important to include large mirrors — or in this case, a wall of mirrors — so you can monitor your progress and your form. Mount a television at eye level. If you have multiple workout areas, opt for an adjustable mounting system so you can see the television no matter where you are in the room. It’s great for watching exercise DVDs or zoning out while you run on the treadmill. Great views — especially those we have here in Colorado — can keep you inspired while you work up a sweat. This home gym design features high ceilings — great for accommodating a hanging bag or other suspended equipment. If you love to swim, add a lap pool to your home gym. A small atrium is the perfect home for the pool with natural light and the feel of being outdoors while you stay comfortable in the luxury of a temperature controlled room. How about turning one floor into a complete workout/gaming/home theater area? Practice your golf swing, challenge the kids to a game of ping pong or lift weights in this home gym. Beautiful flooring and lighting ensure the interior design melds with the rest of the home while the brick creates contrast and lends an “urban gym” feel to the room. You don’t have to have a dedicated room for a great home gym. A long, wide corridor is a functional place to set up a home gym. Equipment lined up along a wall —this one has beautiful views — offers an efficient design. Rubber flooring and large framed mirrors give it the look and feel of a health club. Contact Beautiful Habitat to help you design a home gym to suit your home and lifestyle.